Select good, ripe tomatoes. Scald and mill or strain through a coarse sieve to remove seed and skin. When the tomatoes become cold add the remaining ingredients. Let simmer slowly for 3 hours. When you can leave a trace across the surface of your ketchup, it is ready. Pour into hot sterilized 1-pint jars and seal. 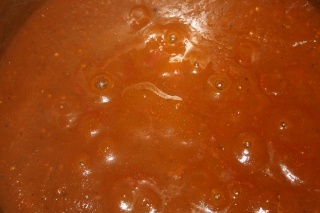 Process for 15 minutes in boiling water bath. Add 5 minutes processing time for altitudes from 1,001 to 6,000 feet, and another 5 minutes if over 6,000 feet. I grind my spices with a pestle and mortar and believe that the best tastes come from fresh ground spice rather than pre-ground - I heartily recommend the investment in a good pestle and mortar. I like to leave the seeds in, but you can sieve them out for a more Heinz look..
OH`s reaction would be does it taste like Heinz? Personally, I hate it, but OH likes it on his fried cheese sandwhiches.